Tom Brokaw, known and beloved for his landmark work in American journalism and for the New York Times bestsellers The Greatest Generation and Boom!, now turns his attention to the challenges that face America in the new millennium, to offer reflections on how we can restore America's greatness. "What happened to the America I thought I knew?" Brokaw writes. "Have we simply wandered off course, but only temporarily? Or have we allowed ourselves to be so divided that we're easy prey for hijackers who could steer us onto a path to a crash landing? . . . I do have some thoughts, original and inspired by others, for our journey into the heart of a new century." Rooted in the values, lessons, and verities of generations past and of his South Dakota upbringing, Brokaw weaves together inspiring stories of Americans who are making a difference and personal stories from his own family history, to engage us in a conversation about our country and to offer ideas for how we can revitalize the promise of the American Dream. Inviting us to foster a rebirth of family, community, and civic engagement as profound as the one that won World War II, built our postwar prosperity, and ushered in the Civil Rights era, Brokaw traces the exciting, unnerving changes in modern life—in values, education, public service, housing, the Internet, and more—that have transformed our society in the decades since the age of thrift in which he was raised. 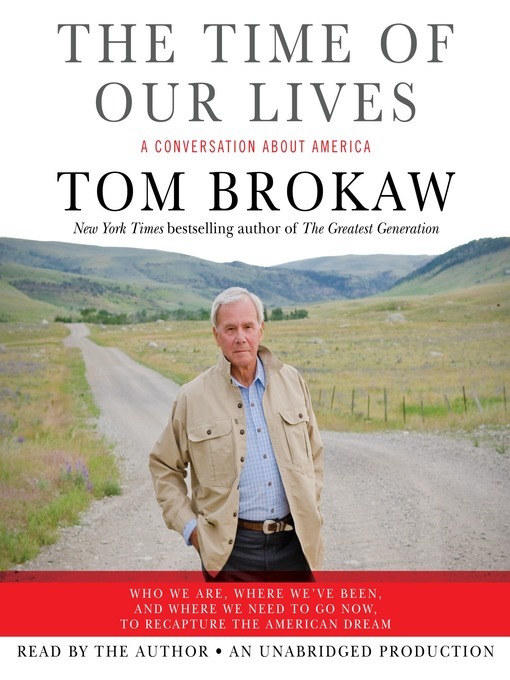 Offering ideas from Americans who are change agents in their communities, in The Time of Our Lives, Brokaw gives us, a wise, honest, and wide-ranging book, a nourishing vision of hopefulness in an age of diminished expectations.